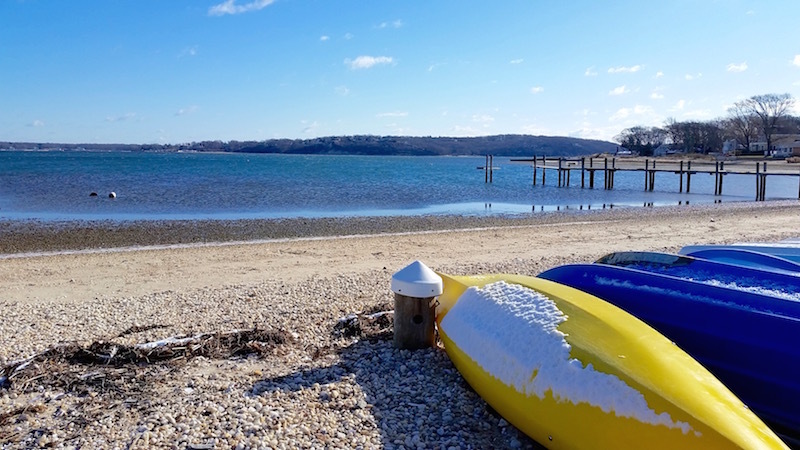 Naturalists on the North Fork have been working since 2009 to put together a network of trails linking the Peconic Bay to Long Island Sound, connecting several hundred acres of land owned by Southold Town, Suffolk County and Greenport Village. The project is expected to take a major step forward this week, with Southold Town slated tonight to vote on the construction of 2.1 more miles of hiking trails, while Greenport Village Trustee Doug Roberts expects to bring a plan to connect the village’s Silver Lake to the network to the village board’s work session this Thursday evening. The Pipes Cove Bridge, reconstructed after Superstorm Sandy as part of the Bay-to-Sound trail program. The proposed trail is slated to wind from Mitchell Park in downtown Greenport, through hundreds of preserved acres surrounding Pipes Cove, north through Moore’s Woods past Silver Lake, ending at Clark’s Beach on the Long Island Sound. The project, which includes trailblazing, informational kiosks, bicycle racks and the replacement last year of a footbridge on Pipes Cove, has been paid for so far through county grant funding and in-kind donations of labor from scouting and volunteer groups. 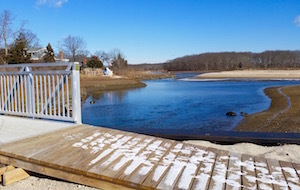 Southold land preservation committee chairman John Sepenoski told the Southold Town Board at a work session Tuesday morning that the town’s public works department would like to spend this winter clearing trails along Arshamomaque Cove and Chapel Lane, creating a total of 3.9 miles of connected trails. 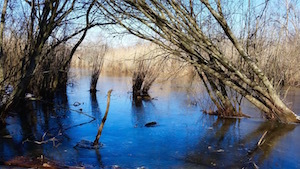 Mr. Sepenoski said the Greenport Village section of the trail linkage had been stalled for some time because the village was considering building engineered wetlands around Silver Lake as part of its Municipal Separate Storm Sewer System. He said the village was unsure about building a boardwalk along Silver Lake in an area that could later be considered a perfect place for engineered wetlands. Wetlands off of Monsell Trail in Greenport may now be included in the Bay-to-Sound trail network. Mr. Roberts’ current proposal would be a walking path that connected the western dirt end of Webb Street (near Frank Field’s former miniature railroad) with Moore’s Lane, behind the Greenport School. It would also call for some improvements to Monsell Trail, a dirt road plagued by illegal dumping. “Trustee Roberts has looked at our plan, and he thinks its a good plan,” said Mr. Sepenoski at Tuesday’s Southold work session. Mr. Sepenoski said the work he has proposed for this winter would be done independent of whether the house at the former Sill property, on Pipes Cove south of Route 25, is developed into a nature center or not. The town board agreed earlier this year to keep the house intact through the winter while examining their options. The gate at the end of Ms. Sill’s dirt driveway on Route 25 has been shut for little over a month, after Ms. Sill, who’d been granted a life estate when she sold her property to the town in 2010, died in November. Mr. Sepenoski said some of the trail network south of Route 25 will be dependent on working with the Long Island Rail Road to install at-grade crossings for the railroad’s Greenport line. The railroad crosses the Sill property. 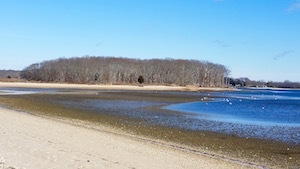 Mr. Sepenoski said the town could put in an off-road trail through preserved land surrounding Pipes Cove, across the railroad tracks to the footbridge, replaced last year, that connects the end of Pipes Neck Road to Posillico Beach. In the meantime, he said, he’d like to focus on the properties north of Route 25. “Adding 2.1 miles to the trails system, it’s pretty substantial,” said Southold Town Supervisor Scott Russell. Mr. Sepenoski said his office is still working to install a few more kiosks and bike racks as the last part of Phase I of the trail network, and will soon be looking for grant money to augment the new work on Phase II.